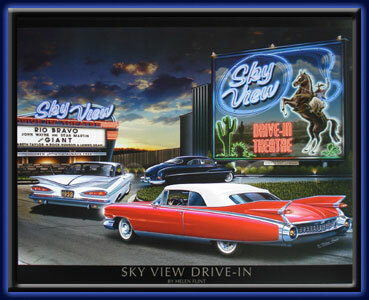 Saturday nights at the Drive-In were the the best! An evening with your best gal...Add your own steamy windows... By artist Helen Flint. Lighting Effects: 21 sequentially flashing green L.E.D. lights on the lasso. 11 sequentially flashing yellow L.E.D. lights on the building. 1 flashing red L.E.D. lights on the navy blue car. 6 yellow L.E.D. lights as lights. 2 white L.E.D. lights as cars head lights. 11 red L.E.D. lights as back lights of the red car. 4 yellow L.E.D. lights as marker car lights.